MONEY makes the world go round but in ever-diminishing circles. It's the driving force behind the world's problems of widening poverty gaps within and between countries, Third World (not only) debt. Thanks to debt money, the world is a nastier place by the day. There seems to be no alternative to social injustice and environmental destruction, simply because there is no money for anything else. 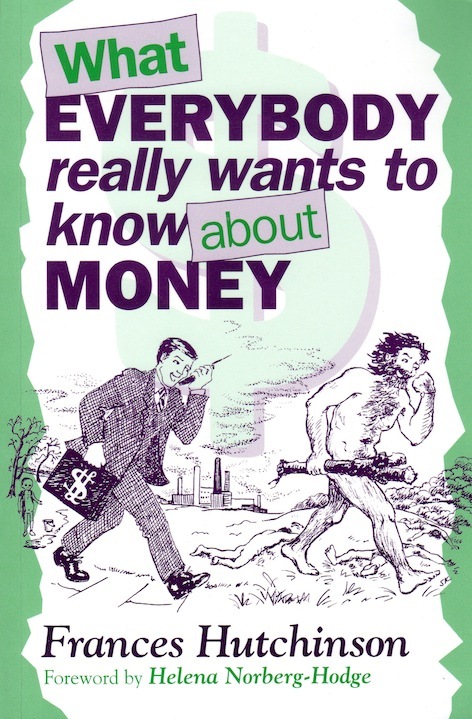 We all use money every day, but we don't understand where it comes from, who creates it, and most importantly, why. As Frances Hutchinson shows, most economists do not have a clue what is going on, and that is partly because they make all sorts of assumptions about human nature that are manifestly nonsense. Since economists have little understanding of the nature of money, they assume it is just a convenient neutral alternative to barter. In fact, money is now traded for its own ends, and has become the universal measure of good and bad. To bring about today's global capitalist free market, work has been devalued to a form of slavery, and people everywhere have been denied access to their natural and basic means of survival: the land. Frances Hutchinson shows, why this situation has arisen, and explains many of the basic errors of the orthodox economics upon which all politicians rely. After discussing the powerful body of ideas that originated in guild socialism and were popularised across the world by the social credit movement in the 1920s and 1930s, she applies these insights to develop a 'home economics' which can be introduced by groups of people in their own localities anywhere in the world.